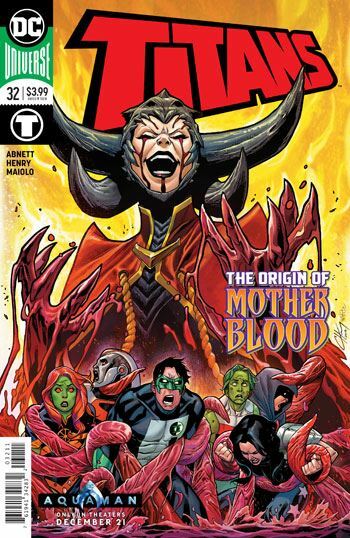 The latest issue of Titans is devoted to introducing a new leader for the Church of Blood. Yes, that is needed. I totally agree. Devoting an entire issue to creating and “crowning” the new leader is not such a bad idea, either. I really don’t mind this story, in and of itself, and yet I find myself less and less interested in this book as it goes on. The Titans themselves appear only briefly at the top of the story, but it seems clear that Kyle Rayner is now a part of the team. Perhaps they will continue with their mandate to hunt out teens affected by the Source Wall, but it wouldn’t surprise me too much if that got dropped or forgotten. The departure of Nightwing, along with the death of Wally West (which none of them seem to care at all about) has derailed the book, far too soon after its reboot. What we are left with, right now, is an incarnation of Titans that feels like it is jumping though hoops to try to cope with larger changes affecting the team. That is never a good situation. Right now the series is reminding me of the first ongoing book to simply call itself Titans. That began so strongly, and yet fell apart dismally. I foresee the same problems here, that in a few months this will no longer feel in any way connected to the relaunch. And that situation is not alleviated by the fact that there is a very good Teen Titans book running right now, and a Young Justice book about to launch. Hate to say it, but despite this issue, which is not a bad one, I am still left feeling that it would be wisest to just pull the plug on this series.